IS demonstration for an action camera. Showing subjects walking. Even the demonstration video states that it's simulated. was shot using a gimbal. It is not a demonstration of the X3000's internal stabilization. It is not at all clear that a combination of camera OIS and gimbal stabilization is better than just gimbal stabilization alone. In any case, this video sheds no light on that either. One hand only using the finger holder attached to LiveView remote. Mistakenly set to 60 Mbps, not 100 Mbps. Vivid color default. 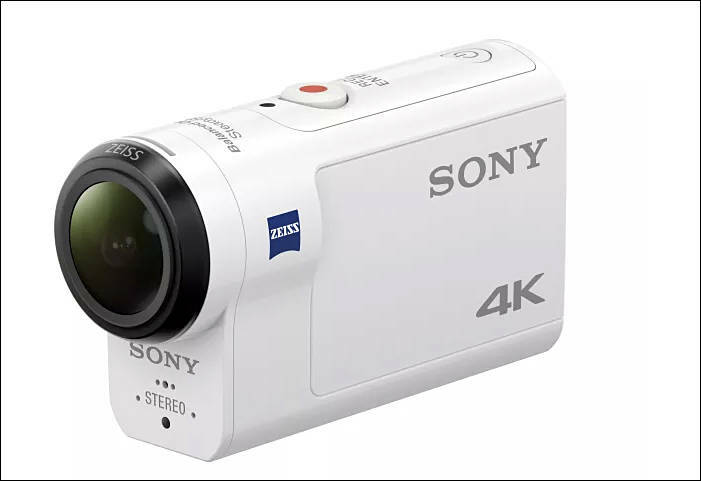 Sony Electronics, a worldwide leader in digital imaging, has today introduced their first POV cameras to feature the innovative Balanced Optical SteadyShot (B.O.SS) image stabilization technology, the FDR-X3000R 4K* model and HDR-AS300R Full HD model. The flagship feature of the two new cameras - Balanced Optical SteadyShot - is an advanced form of image stabilization where internally, the camera’s lens and sensor are joined and moved together to compensate for camera shake caused by excessive motion, whether shooting handheld with optional accessories or during a fast-paced sporting activity. This is a particularly effective technology when paired with a POV action camera design as it ensures captured video footage is smooth and stable - even in 4K or high-frame-rate shooting modes. The new cameras utilize full pixel readout without pixel binning technology to produce exceptionally high resolution and accurate colors in both 4K (FDR-X3000R only) and Full HD videos. This allows them to read and process data from all of the sensor’s pixels, producing highly detailed video content with minimal noise and ‘jaggies’ in a variety of formats including the high data stream XAVC S™ codec (100Mbps in 4K and 50Mbps in Full HD) . The FDR-X3000R can also shoot 120p in Full HD and HDR-AS300R can shoot 120p in HD for impressive slow-motion footage . Both cameras offer a new angle of view adjustment, with a 3x smooth zoom or preset “wide”, “medium” and “narrow” settings. This allows shooters to get even closer to the action during movie recording, and reducing barrel distortion common with wide view POV cameras. Sony’s new Action Cam models will be offered in a kit with a compact Live-View Remote that is about 30% smaller than previous version. The remote, with a mountable design, acts as an extension of the camera and allows users to see what is being recorded when the camera is not accessible. The remote has the ability to control various functionalities including shooting settings, start/stop recording, power on/off and more. It also features an “auto display off” mode that turns off its LCD screen display automatically during shooting in order to save power of both camera and remote. Built-in GPS inherited from previous models is available, allowing location tracking and speedometer to be added to the video file when Action Cam Movie Creator is used. This also allows GPS Data Overlay on video to read your speed data and generate another video file14 that includes your route, speed information, etc. Additionally, an updated version Sony’s own in-built movie creator – Highlight Movie Maker – is available in the new cameras. The innovative feature, which now utilizes face detection technology, automatically assembles footage into a video highlight package and pairs it with custom music for the ultimate viewing experience. The FDR-X3000R and HDR-AS300R have a splash-proof body and are waterproof with supplied Underwater Housing (MPK-UWH1) that is certified down to 197 ft. / 60m in depth. A new range of accessories for Action Cam has also been announced, including the Finger Grip (AKA-FGP1) that is an ideal travel accessory as it enables flexible one-handed shooting and the MC Protector (AKA-MCP1) for extra protection from lens scratches and dirt. $399 for the new camera is $100 less than the predecessor X1000 sold for when it first appeared, and is the same price as the X1000 now. Btw, the old liveview remote (lvr2) works perfectly fine with the new X3000 and is selling for only $79. The only important feature it misses is the ability to turn on and off the camera when you turn on and off the remote. I turned that feature off in the new one, as it required an always-on Bluetooth connection and I preferred anyway to turn off the remote while continuing to shoot with the camera. Can you compare camera stabilizer and camera with it turned off, but on one hand gimbal? Can you make walking videos? It will be also interesting to see comparison with cheaper cameras on gimbal and same cheap camera on monopod/small steadicam + Mercalli stabilization. Sharp. What are the frame rate rate/codec options? For 4K: 24p, 25p, 30p. XAVC S 100mbps or 60mbps. For 1080: 120p, 60p, 30p, 25p, 24p, XAVC S 50mbps for all but 120p. 120p is 100mbps. Also, MP4: 1080 60p, 30p, 25p, at lower bitrates. 720 240p XAVCS 100mbps. Lack of roll axis stabilization shows. Run it through Mercalli and make output as vertical comparison. The original file is downloadable, so anyone can apply whatever software fix they want to experiment with.